Treatment of latent tuberculosis infection (LTBI) is an important component of strategies to achieve global tuberculosis (TB) elimination, but implementation is rarely monitored. This is a retrospective review of TB contact tracing outcomes at one of the busiest TB clinics in Australia, measured against the Centre for Disease Control and Prevention performance indicators. 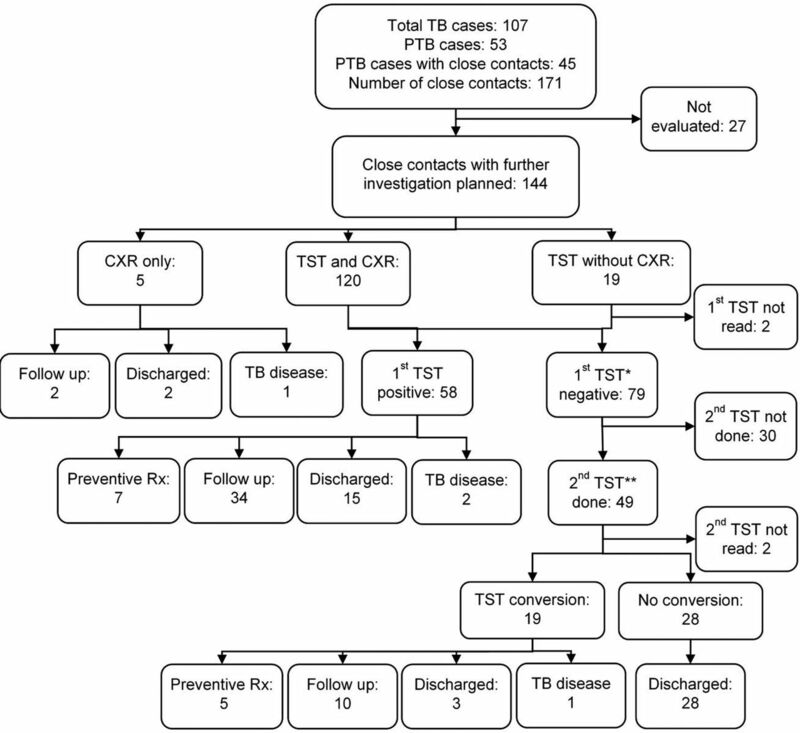 In total, 45 of 53 (85%) pulmonary TB cases had 171 close contacts, of whom 139 (81%) were evaluated with a tuberculin skin test (TST); 58 of 139 (42%) were positive at baseline. Among 57 close contacts of 16 sputum smear-positive TB cases, the elicitation, evaluation, initiation of LTBI treatment and completion rates were 93%, 86%, 14% and 100%, and among 114 close contacts of 37 sputum smear-negative pulmonary TB cases 81%, 83%, 16% and 89%, respectively. Of 79 contacts with an initial negative TST, 19 of 47 (40%) demonstrated TST conversion when retested; 5 of 19 (26%) were offered LTBI treatment. Four secondary TB cases were identified. One incident TB case developed a pleural effusion 5 months after TST conversion, despite LTBI treatment. Apart from young children, LTBI treatment was inconsistently initiated in household TB contacts. Safe and pragmatic treatment options, as well as functional monitoring frameworks, are essential to improve LTBI treatment implementation. In May 2014, the World Health Assembly approved the new WHO End TB strategy, which aims to reduce tuberculosis (TB) incidence and TB-related mortality by 90% and 95%, respectively, by 2035.1 For low TB incidence countries (defined as <10 TB cases per 100 000 population), an action framework was developed with a strong emphasis on enhanced use of TB preventive therapy.2 Effectively interrupting TB transmission and reducing the pool of individuals with latent infection from whom future cases may emerge will be necessary to meet the End TB targets.3 The transmission chain can be interrupted if effective contact tracing identifies and treats all prevalent secondary cases, as well as those with latent tuberculosis infection (LTBI).2 3 Both the ‘End TB Strategy’ and the ‘Low-incidence country action framework’ highlight contact tracing and LTBI treatment as key steps towards ending the TB epidemic.2 4 In Australia, this principle has been advocated by the National Strategic Plan for Control of Tuberculosis 2011–2015,5 and Australia signed the ‘Low-incidence country action framework’ at the World TB Conference in Barcelona in October 2014. However, despite a low TB notification rate of ~6 per 100 000 population per year (5.8 per 100 000 population in 2013),6 progress towards TB elimination has been slow. The state of New South Wales reports the highest TB case numbers in Australia, with most cases diagnosed in metropolitan Sydney.7 Within Sydney the Western Sydney Local Health District (LHD) has the highest TB incidence rate.8 Western Sydney LHD has a cosmopolitan population with migrants from many TB endemic countries,9 10 and is projected to have the highest population growth in New South Wales (2.3% per year) in the coming years, mainly driven by migration from TB endemic countries. In view of the associated TB importation risk, it is important to establish robust public health systems that will prevent local transmission whenever an infectious TB case is identified.2 The Western Sydney LHD developed a TB control strategy aligned with key priorities identified in the ‘Low-incidence countries action framework’, which encourages the expanded use of preventive therapy.2 Here, we assess the performance of contact tracing services in Western Sydney and make recommendation in relation to service improvement and for ongoing quality assurance audits. We performed a retrospective review of all pulmonary TB cases diagnosed at Parramatta Chest Clinic during 2013 (1 January–31 December) and compared the outcomes achieved with relevant Centre for Disease Control and Prevention (CDC) performance indicators. TB case data were collected from the Notifiable Conditions Information Management System, which is a New South Wales secure public health notification database.16 Information on all contacts was collected from original TB contact tracing forms and a local Clinical Surveillance System database that recorded sociodemographic parameters, clinical history and case management plans. Sociodemographic and clinical variables for de-identified cases and contacts were collected and recorded on separate data collection sheets. Additional variables such as history of BCG vaccination and being under TB surveillance, often referred to as a TB undertaking in New South Wales, were also recorded. During 2013, 107 TB cases were managed at Parramatta Chest Clinic; 53 had pulmonary TB, of whom 16 (30%) were sputum smear-positive. Table 1 summarises the relevant characteristics of the pulmonary TB cases identified. Most (50 of 53; 94%) were born overseas, and CXR abnormalities warranting active postmigration TB surveillance were identified at migration screening in 16 of 50 (32%), of whom 7 of 16 (44%) were diagnosed with pulmonary TB after the period of active surveillance. In total, 45 (85%) pulmonary TB cases identified close contacts, with a median of 3 close contacts per case (IQR: 2–4). Of the 243 close contacts elicited, 171 (70%) resided in Western Sydney LHD and were included in this analysis. The other 72 close contacts were referred to their local chest clinics for management. Figure 1 reflects the data for the 171 close contacts residing in Western Sydney LHD; 144 (84%) presented for TB screening, of whom 120 (70%) received TST and CXR and 19 (11%) only a TST. Five (3%) contacts had a previous positive TST and received a CXR only. Nearly everyone who received a TST (137 of 139; 99%) returned for the reading; 54 (39%) recorded a positive (≥10 mm), 4 (3%) an intermediate (5–9 mm) and 79 (58%) a negative (<5 mm) reading. Of the 79 contacts with a negative first TST, 49 (62%) had a second TST, of whom 47 (96%) returned for the reading; 19 (40%) demonstrated TST conversion. Those with a negative or absent second TST reading were discharged from follow-up. Contacts with an indeterminate first TST reading (5–9 mm) were assigned to CXR surveillance, which only 1 (25%) completed. Among the close contacts identified, 14 of 171 (8%) were young children (<5 years of age). None were diagnosed with TB disease, but two had a positive TST and completed LTBI treatment. One had a TST reading of 6 mm (no BCG vaccination; repeat TST 12 mm) and was put on CXR surveillance, which was not completed. Of the 11 children with a negative first TST, none were provided ‘window prophylaxis’, six (60%) had a second TST that was negative and all were discharged from follow-up. Flow diagram demonstrating the management of close contacts of pulmonary TB cases diagnosed at Parramatta Chest Clinic, Sydney, Australia. *None of the contacts with a negative first TST had relevant CXR abnormalities. **A second TST was done if the first TST was negative and performed within the theoretical ’conversion window’. CXR, chest radiograph; PTD, pulmonary tuberculosis; Rx, treatment; TB, tuberculosis; TST, tuberculin skin test. Overall, 64 of 171 (37%) close contacts completed screening and follow-up as advised, 3 (2%) were transferred to other area health services, 27 (16%) failed to present for screening, and 77 (45%) initiated screening but did not complete their follow-up. We identified four secondary TB cases; three were diagnosed during initial screening (prevalent cases) and one during subsequent follow-up (incident case). Three of the secondary TB cases had negative cultures, but one was sputum smear-positive and culture-positive with a 24-locus multiple interspersed repetitive unit profile that was identical to the likely source case. The one incident case that developed TB after documented TST conversion did so while on LTBI treatment. He collected monthly isoniazid tablets for 5 months (adherence with daily unsupervised therapy uncertain) before developing a pleural effusion that was culture-negative but treated as TB. The organism isolated from his likely source case was sensitive to isoniazid. He received a prolonged course of standard four-drug treatment and made a complete recovery. Table 2 reflects the management of close contacts of sputum smear-positive and smear-negative pulmonary TB cases compared with the CDC performance targets. Of 16 sputum smear-positive cases, 15 (94%) indicated at least one close contact. In total 57 close contacts were identified, of whom 49 (86%) were evaluated. At baseline evaluation, 16 of 49 (33%) were diagnosed with LTBI, of whom 1 (6%) was started on LTBI treatment and the rest (15; 94%) opted for CXR surveillance, which only 4 of 15 (27%) completed. Of those who received a second TST, 5 of 21 (24%) were diagnosed with TST conversion, of whom 2 received and completed LTBI treatment and 3 opted for CXR surveillance, which only 1 (33%) completed. Among the close contacts of all sputum pulmonary TB cases (both sputum smear-positive and smear-negative), 58 of 137 (42.3%) of those tested had a positive TST at baseline; 7 (12%) commenced LTBI treatment and 51 (88%) opted for CXR surveillance, which 15 (29%) completed. Of those who received a second TST, 19 of 49 (39%) were diagnosed with TST conversion, of whom 5 (26%) received and completed LTBI treatment and 14 (74%) were placed on CXR surveillance, which 3 (21%) completed. Few young children (<5 years of age) had documented LTBI, but 100% of those with a TST reading ≥10 mm received preventive therapy and completed their full course of treatment. A single child with an indeterminate (6 mm) TST was placed on CXR surveillance. Although none of the children whose first TST was negative demonstrated TST conversion on repeat testing, ‘window prophylaxis’ was not offered. ‘Window prophylaxis’ requires consideration in young children who are at high risk of rapid disease progression following primary Mycobacterium tuberculosis infection,20 even if the initial TST or interferon-γ release assay (IGRA) result performed during the ‘conversion window’ (first 6–8 weeks after the end of TB exposure) is negative. International guidance encourages the provision of preventive therapy in this vulnerable population irrespective of the TST result, particularly in settings where LTBI testing is problematic.3 14 21–23 The most recent WHO LTBI treatment guidance encourages the use of water-dispersible isoniazid and rifampicin fixed-dose combination tablets for a period of 3 months.21 These ‘child-friendly’ medications are now available through the Global Drug Facility,24 also to high-income countries like Australia, but given incountry restrictions on the registration of therapeutic drugs the use of special access schemes is required to make these drugs available to children. Guidelines in many countries used to discourage the use of isoniazid preventive therapy in people older than 35 years of age given hepatotoxicity concerns. However, in the absence of excessive alcohol use or known liver disease, the risk of isoniazid-induced hepatotoxicity is mainly elevated in people older than 60 years of age, and the most recent National Institute for Health and Care Excellence guideline (2016) recommends preventive therapy up to the age of 65 years.29 30 Newer treatment regimens such as weekly isoniazid and rifapentine for 3 months (12 weekly doses), which is now the standard of care in the USA, are generally well tolerated across a wide age range,31 but rifapentine access outside the USA is limited, and it is currently not registered for use in Australia. Previous studies reported poor treatment completion rates in healthy adult contacts provided with 6–9 months of isoniazid preventive therapy,32 but our study found excellent treatment completion rates when LTBI treatment was advised by the local clinician. Adherence rates are expected to be even higher if shorter LTBI treatment regimens become more widely available. Our findings demonstrate that the option of CXR follow-up is hardly satisfactory, given low completion rates. Study limitations include the relatively small and geographically focused study population, but we believe it provides a good snapshot of the overall management of TB contacts in Western Sydney, which is highly representative of cosmopolitan urban Australia. BCG vaccination may have confounded some TST results, but BCG vaccination or the presence of a BCG scar was not consistently documented in the clinical notes and could not be analysed. During the study period IGRAs were not available for routine LTBI evaluation, but these have since been endorsed for this purpose and widespread use should improve the specificity of LTBI detection in BCG-vaccinated individuals.21 38 The HIV status of TB contacts was not recorded, which may significantly increase an individual’s risk of developing TB if LTBI is detected.39 However, HIV testing of TB contacts is not routinely performed given that the prevalence of HIV infection in Western Sydney is very low, even among patients with TB and their families. In conclusion, we documented good TB contact elicitation and evaluation rates in Western Sydney, falling just short of the CDC targets. However, few contacts with documented LTBI received preventive therapy, except for children <5 years of age. This highlights the challenges of wide-scale LTBI treatment in contacts considered to be at low risk of future disease progression, as well as the need to provide clinicians with feasible and minimal risk treatment options, while policy makers require convincing cost:benefit analyses to motivate wide-scale implementation. We thank the nursing and administration staff involved in the management and contact tracing of pulmonary TB cases and their contacts at Parramatta Chest Clinic. We also thank the NSW Mycobacterial Reference Laboratory, especially Professor Vitali Sintchenko and Basel Suliman, for providing the available culture, MIRU-24 and drug susceptibility testing data. World Health Organization. The end TB strategy. Geneva, Switzerland, 2014. Available from: http://www.who.int/tb/strategy/End_TB_Strategy.pdf?ua=1 [accessed 9 May 2017].
. Global strategy and targets for tuberculosis prevention, care and control after 2015. Geneva, Switzerland, 2017. Available from: http://apps.who.int/gb/ebwha/pdf_files/EB134/B134_12-en.pdf?ua=1 [accessed 2 May 2017]. Communicable Diseases Network Australia. The strategic plan for control of tuberculosis in Australia: 2011–2015. Australia, 2012. Available from: http://www.health.gov.au/internet/main/publishing.nsf/Content/cda-cdi3603i.htm [accessed 1 May 2017].
. Tuberculosis notifications in Australia, 2014. Commun Dis Intell Q Rep 2017;41:E247–E63.
. Tuberculosis notifications in Australia, 2012 and 2013. Commun Dis Intell Q Rep 2015;39:E217–35.
. Tuberculosis New South Wales: 2012-2014. NSW, Australia, 2014. Available from: http://www.health.nsw.gov.au/Infectious/tuberculosis/Documents/tb-report-2012-14.pdf [accessed 2 April 2018]. Epidemiology EMS WSLHD Social and Health Atlas, 2012. Epidemiology, Executive medical services. Available from: https://www.wslhd.health.nsw.gov.au/SocialHealthAtlas/ [accessed 2 April 2018].
. Tuberculosis contact tracing [Policy Directive]. NSW, Australia, 2008. Available from: http://www1.health.nsw.gov.au/pds/Pages/doc.aspx?dn=PD2008_017 [accessed 27 Jun 2017].
. The role of tuberculosis services in NSW, Australia, 2014. Available from: http://www.health.nsw.gov.au/Infectious/tuberculosis/Documents/GPCTB-role-of-TB-services.pdf [accessed 21 Jun 2017].
. Tuberculin skin testing,testing and diagnosis, USA, 2016. Available from: https://www.cdc.gov/tb/publications/factsheets/testing/skintesting.htm [accessed 2 Jul 2018].
. Guidance for national tuberculosis programmes on the management of tuberculosis in children. Geneva, Switzerland, 2014. Available from: http://apps.who.int/medicinedocs/documents/s21535en/s21535en.pdf [accessed 3 Jul 2017]. Centers for Disease Control and Prevention. Latent tuberculosis infection: guide for primary health care providers. GA, USA, 2014. Available from: https://www.cdc.gov/tb/publications/ltbi/diagnosis.htm [accessed 1 Jun 2017].
. Notifiable Conditions. Australia: NSW Health, 2017. Available from: http://www.health.nsw.gov.au/epidemiology/Pages/notifiable-conditions.aspx [accessed 1 Jul 2018]. Centers for Disease Control and Prevention. National TB program objectives and performance target for 2020. GA, USA, 2015. Available from: https://www.cdc.gov/tb/programs/evaluation/indicators/default.htm [accessed 1 Jun 2017].
. Latent tuberculosis infection, updated and consolidated guidelines for programmatic management. Geneva, Switzerland, 2018. Available from: http://www.who.int/tb/publications/2018/latent-tuberculosis-infection/en/ [accessed 1 Jun 2018].
. The burden of childhood tuberculosis: a public health perspective. Int J Tuberc Lung Dis 2005;9:1305–13.
. Tuberculosis (NICE guideline 33). London, 2016. Available from: https://www.nice.org.uk/guidance/ng33 [accessed 19 Jul 2018].
. Global tuberculosis report 2017. Geneva, Switzerland, 2017. Available from: http://www.who.int/tb/publications/global_report/en/ [accessed 6 Jun 2018]. Contributors LP and SKB drafted the proposal with input from all authors. LP, NH, HA and SN helped to collect and analyse the data. LP, SKB and J-GC drafted the initial manuscript with guidance from SC and BJM. All authors helped to refine the manuscript and approved the final version. Ethics approval Ethics approval was obtained from the Western Sydney LHD Human Research Ethics Committee (AU RED LNR/WMEAD/191).